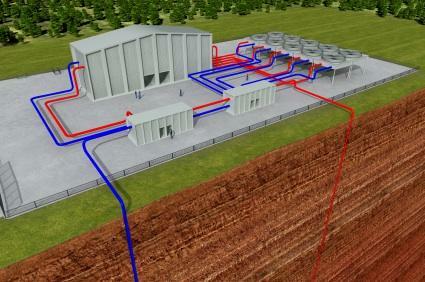 Geothermal energy is a good alternative of fossil fossils for producing geothermal electricity. It ensures less use of oil, coal and gas and less emission of greenhouse gasses and ultimately save us from the danger of global warming. The favorable geothermal energy facts many households are using this source of energy which not only decrease their electric bills but also is eco-friendly. Usually a question is asked that can geothermal energy be employed at home. Well, the answer to it is that it can be used. It is not necessary that you can enjoy this limitless form of energy can only be enjoyed in equators or in extremely hot region. Many homes can tap into it. Tunnels dug underground vertically or horizontally use geothermal power to bring your home temperature to earth temperature; it helps you to go below or above that temperature that is the house is either cooled or heated. This is called as ground source heating or cooling. How Does the Process of Cooling and Heating Takes Place? The temperature of the earth remains constant around 58 to 60 degrees. Tunnels dug five to six feet deep or up to four hundred feet long can help us in driving the energy and a noticeable decrease of 70% in electric bills occurs. The setup of these tunnels is quite expensive but if the process starts then the effective cost becomes very less in a short period of time. Actually no matter how much is the temperature outside, the temperature deep down would always be in 50 degrees; which is very near to the ideal. You can always reach a comfort zone. If it is too cold then you can add some heat to your home by driving energy from the earth. It takes very less time to cool your home in summers as the duct continuously pumps cooled air into every corner of your home. This means that you can maintain your home temperature without spending much money. The thermostat needs not to be turned up very high or very low in summers and winters respectively. This geothermal source saves almost 40% of what is spent on other cooling and heating systems. 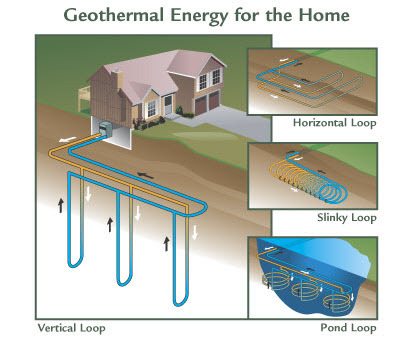 The major parts of geothermal home systems are: an underground loop, a heating pipe and a heat dispenser. Plastic pipes are dug into the ground for the ground loop. The depth of these pipes decides the amount of energy provided. It is important that they should reach the energy source. A mixture of water and anti-freeze goes from the pipes and comes back to the heating pipe where the hotness is removed and the mixture is transferred to the dispenser either by force or by radiant heating, while the reverse happens for cooling in summers. The heat from the liquid is dissipated into the ground and cooled liquid is then processed by forcing air devices which use air coils like air conditioners. This is how it works and serves as a source of maintaining temperature of a home. Keeping in view the advantages of eco-friendly and limitless geothermal energy, it should be made locally or on a larger scale. In this way the dangers of pollution and global warming would be reduced.